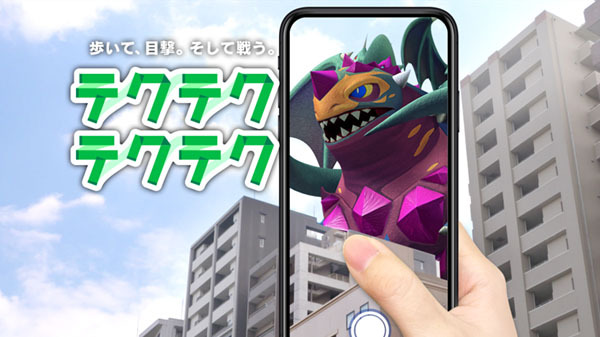 Teku-Teku Teku-Teku, the “lifetime walking RPG” from Koichi Nakamura and Kazuya Asano announced in October, will launch for smartphones in Japan on November 29, publisher Dwango announced. Teku-Teku Teku-Teku is an RPG where you fill out the map by walking through cities. Various monsters designed by Shiren the Wanderer character designer Kaoru Hasegawa will appear on the streets, which you can repel through slash battles. You can earn items by defeating enemies and level up. You can also encounter huge boss monsters bigger than buildings, including collaborations that match the scale of the monster—from Evangelion‘s Fourth Angel to Japanese singer Sachiko Kobayashi, Pop Team Epic‘s Popko and Pipimi, and Shin Godzilla‘s Godzilla. There is also an “Item Drip” system through which you can produce new items by fusing (“dripping”) obtained items, or befriend monsters by fusing monster materials. There are also micro-transaction-based items called “Walking Stones,” which can be used to reduce the amount of time it takes to open valuable treasure chests or let you continue when defeated by monsters. Watch a trailer and 10-minute gameplay demonstration video below. Visit the official website here.